Prosciutto pasta recipes can get boring after a while. 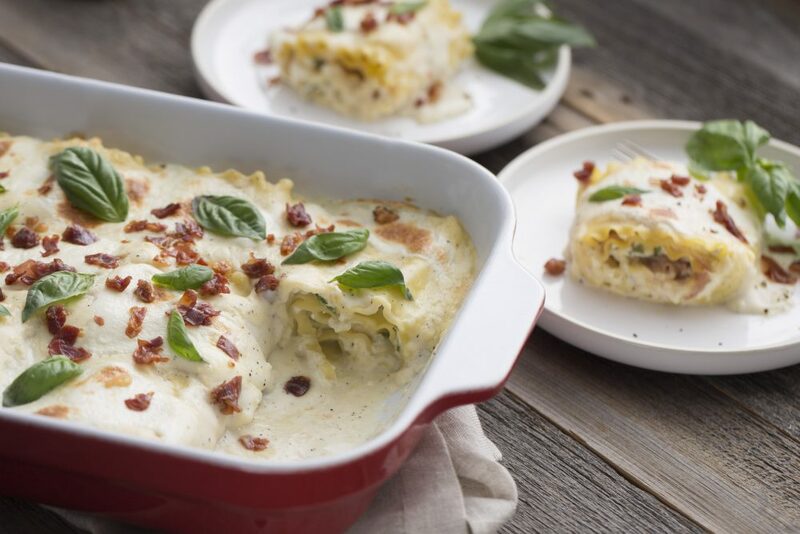 Switch things up with these rich and creamy, white lasagna roll ups with prosciutto and arugula. This meal is decadent, satisfying and simple to make. This prosciutto pasta recipe is perfect for a cozy night in or for the next time you host your family and friends. Preheat oven to 375F. Coat a 2-quart baking dish with no-stick cooking spray. Heat a medium saucepot over medium-high heat and cook chopped prosciutto until crispy; reserve. In same saucepot, melt butter over medium heat. Add flour and cook until golden. Stir in milk, garlic, kosher salt and pepper and simmer on low until thickened, about 10 minutes. Spread 1 cup sauce over bottom of prepared baking dish. In large bowl combine ricotta cheese, Parmesan and egg until blended. Chop 2 Tablespoons basil leaves and stir chopped basil and arugula into cheese mixture. Arrange lasagna noodles on flat surface. Spread cheese mixture over noodles, dividing evenly. Top with halved prosciutto slices. Roll up and arrange, seam side down, in prepared baking dish. Pour remaining sauce over rollups. Bake, covered, 45 minutes. Uncover and top with fresh mozzarella. Return to oven and cook, uncovered, 10 minutes or until sauce is hot and bubbly and cheese is melted. Top with crispy prosciutto and remaining basil leaves.